The State of Delaware is on a mission to improve the oral and overall health of its children because a healthy smile should last a lifetime. 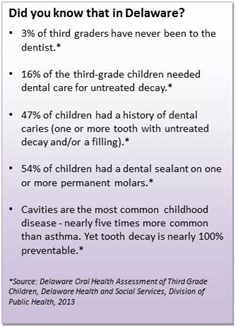 While tooth decay is the most common childhood disease, it is also nearly 100% preventable. This is why the Division of Public Health has launched First Smile Delaware, a campaign aimed at improving oral health literacy and behaviors throughout the state. First Smile Delaware is designed to provide parents and dental and medical providers with the tools needed to improve our state’s oral and overall health. Dental disease can negatively impact your wellbeing and quality of life. Making this issue a priority represents one of the greatest opportunities to improve the health of our citizens. This is a battle that can be won – follow the links below to get started.